Can Cats Contract Hepatitis C From Humans? "I enjoy sharing, but not quite that much." A zoonotic disease is one that can transfer between humans and animals. Though bacteria, parasites and other organisms can cross species, it's rare for viruses to stray outside their host species. Hepatitis C, caused by a virus, is not one to worry about. Hepatitis C is a virus infecting the liver, usually spread when the blood of an infected person enters the body of another person. Although it's natural to wonder if Ginger could contract the disease by scratching an infected person, there's no evidence it's possible. Cats can develop hepatitis, but hepatitis C isn't an ailment cats contract. Because the virus isn't spread through casual contact and must enter the bloodstream, it's highly unlikely that Ginger could act as an agent to spread the disease between people. According to Worms and Germs Blog, Ginger would have to first scratch a person who has hepatitis C circulating in his bloodstream. The scratch would have to draw blood and not only contaminate Ginger's claws, but would also have to survive on her claws long enough for her to scratch someone else deep enough to draw blood. The virus would have to go from her claws into the person's bloodstream. The most common cause of liver disease in cats is hepatic lipidosis, an excessive accumulation of fat in the liver that leads to liver failure. There's no known cause for this condition, but it's usually associated with a period of poor appetite. If Ginger's lost a lot of weight -- up to 30 or 40 percent of her body weight -- has had a poor appetite or been lethargic, she may be suffering from hepatic lipidosis. Treatment for hepatic lipidosis includes fluid therapy to correct dehydration, and getting Ginger to eat. Cats who are diagnosed and treated promptly have a good outlook of recovery from hepatic lipidosis. Inflammatory liver disease is the second most common liver disease in cats and can manifest in two forms. Cholangiohepatitis, an inflammation of the duct connecting the liver and gallbladder, is one form that can be acute or chronic. Symptoms for both types of cholangiohepatitis include jaundice, lethargy, vomiting, poor appetite, abdominal bloating and weight loss. Fluids, antibiotics and other drugs are used for treatment. Prognosis ranges from favorable to terminal. Lymphocytic portal hepatitis is the second type of inflammatory liver disease. The cause is unknown, but it appears to be related to immune function. Symptoms include decreased appetite and weight loss, occasionally with vomiting, lethargy, diarrhea and fever. Fluid therapy and nutritional support are usually part of treatment; occasionally antibiotics and immunosuppressive drugs are successful in treating the disease. Zoonotic diseases are transmitted through direct contact with secretions or excretions of an infected cat, such a saliva or feces, as well as food and water contaminated by an infected cat. Fleas and ticks can also transmit disease from other animals to you or Ginger. She could pass several illnesses to you -- accidentally, of course. 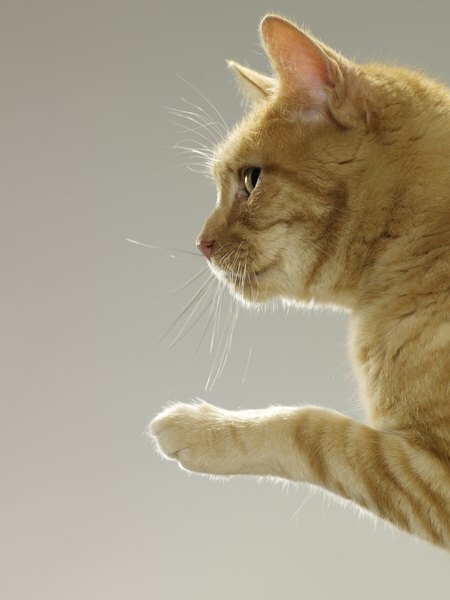 Bacterial zoonotic diseases include cat scratch disease and salmonellosis. Roundworms and hookworms are common parasitic zoonotic diseases. Cryptosporidiosis, giardiasis, and toxoplasmosis are protozoan zoonotic illnesses. Though viruses are usually limited to host species, rabies is one virus that can transmit from animals to humans. Most zoonotic diseases are very preventable: It boils down to basic good hygiene. Always wash your hands after cuddling with Ginger or cleaning her litter box. Keeping her inside and practicing flea and tick control will minimize her risk of exposure to carriers. Cornell University College of Veterinary Medicine: Zoonotic Disease: What Can I Catch From My Cat? Can Canine Whip Worms Be Contagious to a Cat? How Do Dogs & Cats Transmit Hookworms to Each Other?